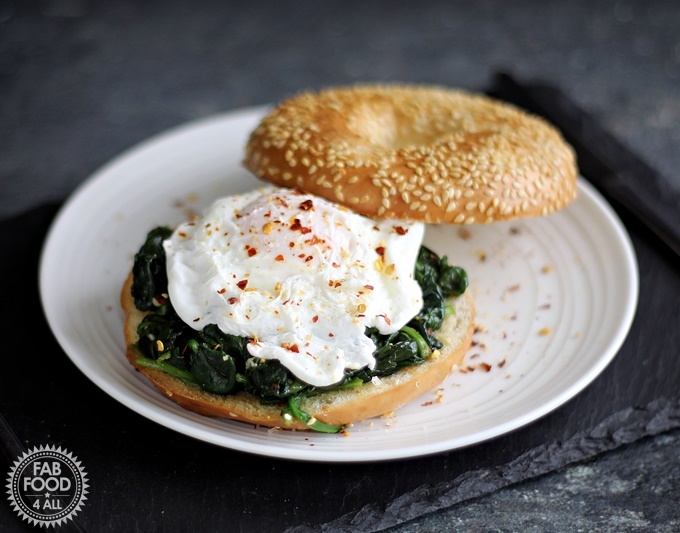 I’m very excited to re-publish my Quick Poached Egg & Garlic Spinach Bagel recipe with new photography! Last week Fab Food 4 All turned 7 so to mark the occasion I treated myself to a new camera – the Canon EOS 5D Mark IV. Not being the most technically minded person I was a little nervous of getting to know my new camera. 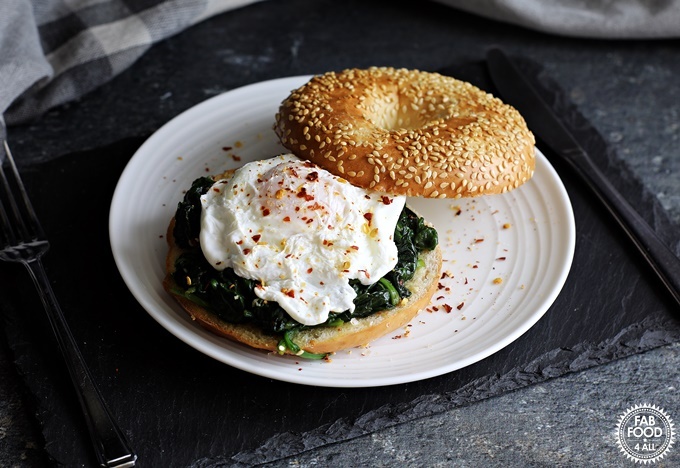 So with a little help from hubby who is a tech whizz I decided to jump in the deep end and re-shoot my Quick Poached Egg & Garlic Spinach Bagel. I think there’s a manual in the box but I’m terrible at taking in written instructions so haven’t even looked! The joy was being able to see my photos in a live view on my laptop and take them with my laptop. I’m really impressed with the quality of the pictures so far and can’t wait to get to know this camera better! 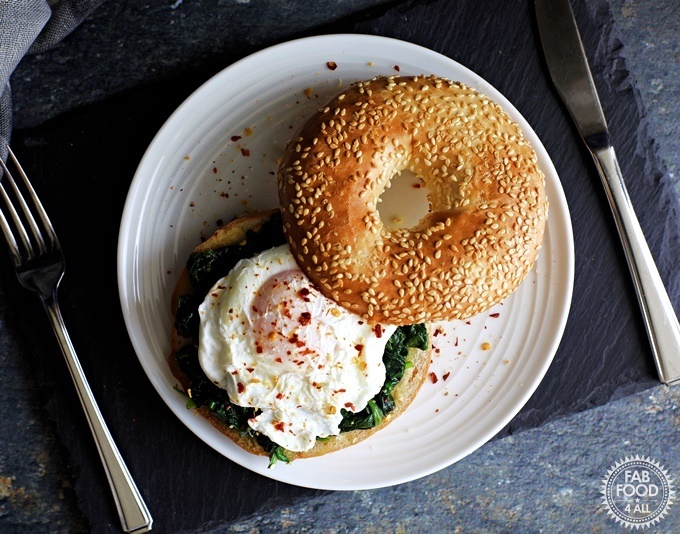 But that’s enough about my new camera, let’s get back to the original write up for Quick Poached Egg & Garlic Spinach Bagel which has become a favourite here! The only change to the recipe I’ve made is the inclusion of a grinding of dried red chilli and garlic. If you can find a chilli & garlic grinder it marries so well with this dish, otherwise just use freshly ground black pepper. Having had a very long lie in on Saturday (along with my daughter) I knew that a healthy brunch was definitely called for! Spying 2 bags of baby leaf spinach that needed using up I had an idea loosely based on something my mum used to serve which was spinach in a white sauce with a poached egg on toast. As a kid I loathed this dish but I’d love it now! However I didn’t have the patience to make a white sauce as it was getting late. 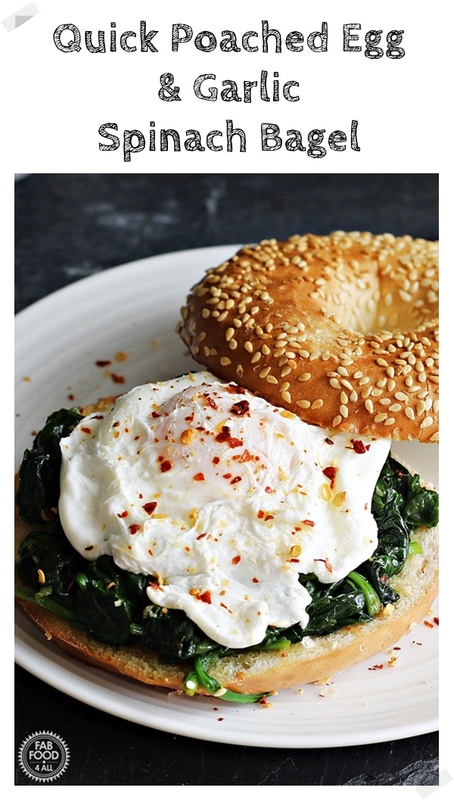 Instead, I decided to wilt the spinach down with some garlic, oil and seasoning and then top with a poached egg on a bagel. 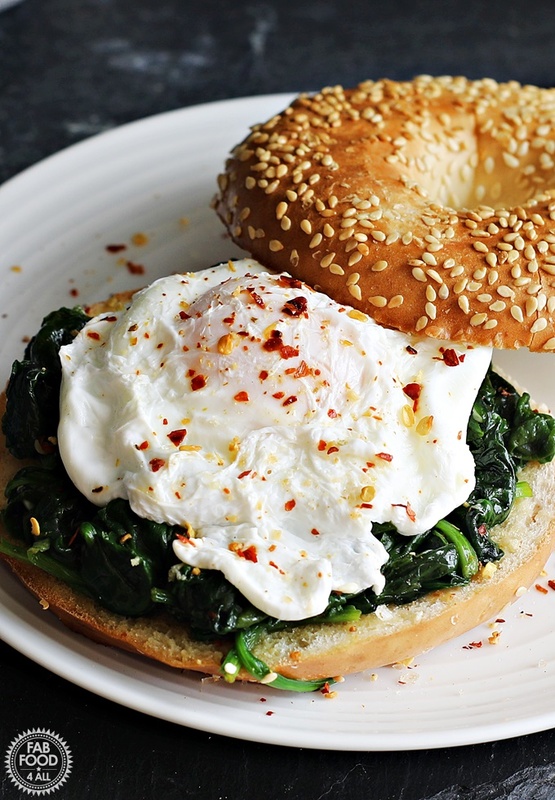 My daughter who usually avoids steamed spinach was tucking into her Quick Poached Egg & Garlic Spinach Bagel like there was no tomorrow. The compliments were flying from my son and hubby too. It really was a lush and healthy brunch. We enjoyed so much so that we had it again the following day. What’s your favourite healthy brunch? Do let me know in the comments below! 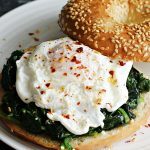 If you make my Quick Poached Egg with Garlic Spinach Bagel do share with me on Instagram or Twitter by tagging @fabfood4all as I love to see your creations! 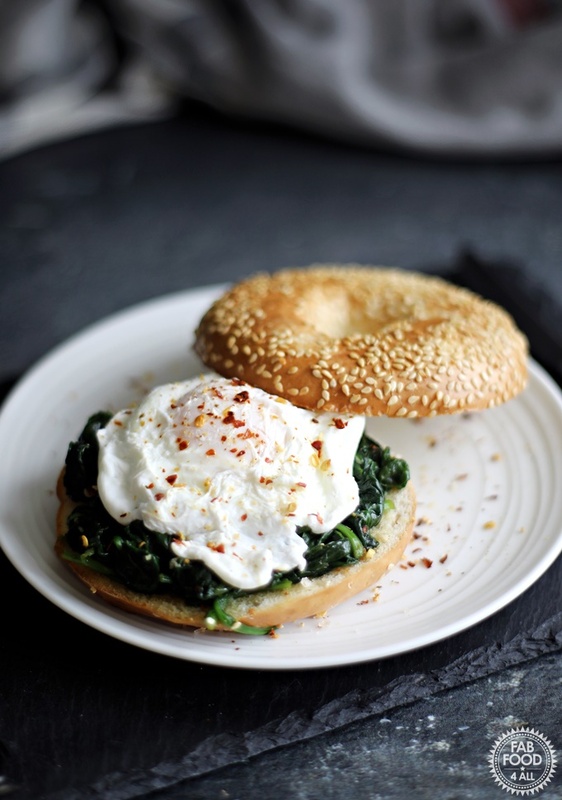 Quick Poached Egg & Garlic Spinach Bagel is the perfect healthy and delicious brunch! Heat the oil in a wok and gently fry the crushed garlic for a minute without colouring. Add the spinach and seasoning, tossing in the garlic oil. Put a lid on the pan to allow the leaves to wilt, removing a couple of times to toss the leaves (particularly if using spinach not baby leaf spinach). Meanwhile poach your eggs by filling a small frying pan with boiling water from the kettle and a splash of vinegar. Crack you eggs one at a time into a ramekin. Gently lower the ramekin into the boiling water tipping out the egg, and as you lift the ramekin back out sweep it up and back over the egg to keep it a nice shape. Time for 3 minutes for a yolk with a runny middle (or to your preference). Once the spinach has wilted (takes a few minutes) turn up the heat and fry for a couple of minutes (the baby leaves tend to release a lot of water so just squeeze on the edge of the pan before serving). The eggs once ready should be placed with a slotted spoon onto a plate lined with a couple of sheets of kitchen towel to absorb the water. 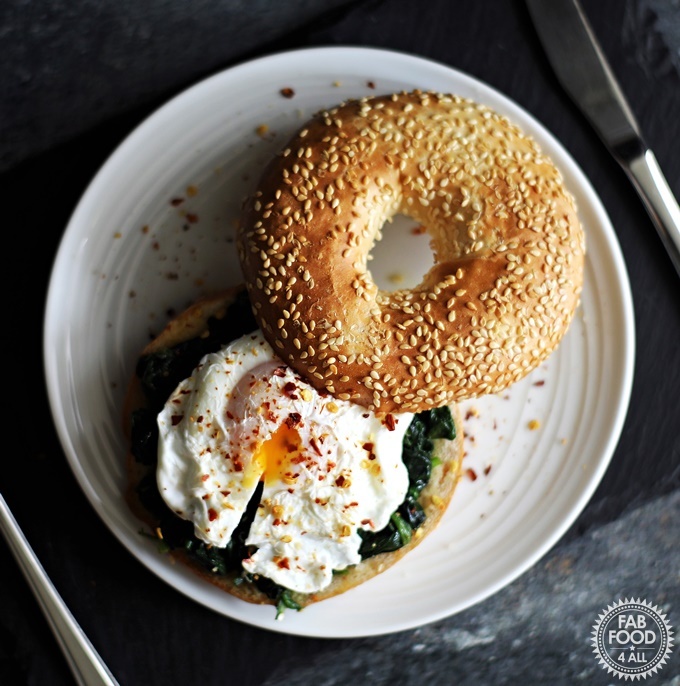 Divide the spinach into 4 and use a slotted spoon to serve onto the bagels, followed by the egg and bagel lid. Finish with a grinding of dried red chilli and garlic. Poached egg and garlic yes please! I can’t wait to have this at the weekend.